The Diamond Sūtra (Sanskrit:Vajracchedikā Prajñāpāramitā Sūtra) is a Mahāyāna (Buddhist) sūtra from the Prajñāpāramitā, or "Perfection of Wisdom" genre, and emphasizes the practice of non-abiding and non-attachment. The Diamond sutra is one of the most influential Mahayana sutras in East Asia, and is a key object of devotion and study in Zen Buddhism. A copy of the Chinese version of Diamond Sūtra, found among the Dunhuang manuscripts in the early 20th century by Aurel Stein, was dated back to May 11, 868. It is, in the words of the British Library, "the earliest complete survival of a dated printed book." The Sanskrit title for the sūtra is the Vajracchedikā Prajñāpāramitā Sūtra, which may be translated roughly as the "Vajra Cutter Perfection of Wisdom Sūtra." In English, shortened forms such as Diamond Sūtra and Vajra Sūtra are common. The title relies on the power of the vajra (diamond or thunderbolt) to cut things as a metaphor for the type of wisdom that cuts and shatters illusions to get to ultimate reality. The sutra is also called by the name Triśatikā Prajñāpāramitā Sūtra (300 lines Perfection of Insight sutra). The full history of the text remains unknown, but Japanese scholars generally consider the Diamond Sūtra to be from a very early date in the development of Prajñāpāramitā literature. Some western scholars such as Gregory Schopen also believe that the Aṣṭasāhasrikā Prajñāpāramitā Sūtra was adapted from the earlier Vajracchedikā Prajñāpāramitā Sūtra. Early western scholarship on the Diamond Sūtra is summarized by Müller. The Vajracchedika sutra was an influential work in the North Indian Mahayana Buddhist tradition. Buddhist philosophers such as Asanga and Vasubandhu wrote commentaries on the sutra. The first translation of the Diamond Sūtra into Chinese is thought to have been made in 401 by the venerated and prolific translator Kumārajīva. Kumārajīva's translation style is distinctive, possessing a flowing smoothness that reflects his prioritization on conveying the meaning as opposed to precise literal rendering. The Kumārajīva translation has been particularly highly regarded over the centuries, and it is this version that appears on the 868 Dunhuang scroll. It is the most widely used and chanted Chinese version. In addition to the Kumārajīva translation, a number of later translations exist. The Diamond Sūtra was again translated from Sanskrit into Chinese by Bodhiruci in 509, Paramārtha in 558, Dharmagupta (twice, in 590 and in 605~616), Xuanzang (twice, in 648 and in 660~663), and Yijing in 703. The Chinese Buddhist monk Xuanzang visited a Mahāsāṃghika-Lokottaravāda monastery at Bamiyan, Afghanistan, in the 7th century. Using Xuanzang's travel accounts, modern archaeologists have identified the site of this monastery. Birchbark manuscript fragments of several Mahāyāna sūtras have been discovered at the site, including the Vajracchedikā Prajñāpāramitā Sūtra (MS 2385), and these are now part of the Schøyen Collection. This manuscript was written in the Sanskrit language, and written in an ornate form of the Gupta script. This same Sanskrit manuscript also contains the Medicine Buddha Sūtra (Bhaiṣajyaguruvaiḍūryaprabhārāja Sūtra). The Diamond Sūtra gave rise to a culture of artwork, sūtra veneration, and commentaries in East Asian Buddhism. By the end of the Tang Dynasty (907) in China there were over 800 commentaries written on it (only 32 survive), such as those by prominent Chinese Buddhists like Sengzhao, Xie Lingyun, Zhiyi, Jizang, Kuiji and Zongmi. One of the best known commentaries is the Exegesis on the Diamond Sutra by Huineng, the Sixth Patriarch of the Chan School. The Vajracchedikā Prajñāpāramitā Sutra contains the discourse of the Buddha to a senior monk, Subhuti. Its major themes are anatman (not-self), the emptiness of all phenomena (though the term 'Shunyata' itself does not appear in the text), the liberation of all beings without attachment and the importance of spreading and teaching the Diamond sutra itself. In his commentary on the Diamond Sūtra, Hsing Yun describes the four main points from the sūtra as giving without attachment to self, liberating beings without notions of self and other, living without attachment, and cultivating without attainment. According to Shigenori Nagamoto the major goal of the Diamond sutra is: "an existential project aiming at achieving and embodying a non-discriminatory basis for knowledge" or "the emancipation from the fundamental ignorance of not knowing how to experience reality as it is." In the sūtra, the Buddha has finished his daily walk to Sravasti with the monks to gather offerings of food, and he sits down to rest. Elder Subhūti comes forth and asks the Buddha a question: "How, Lord, should one who has set out on the bodhisattva path take his stand, how should he proceed, how should he control the mind?" What follows is a dialogue regarding the nature of the 'perfection of insight' (Prajñāpāramitā) and the nature of ultimate reality (which is illusory and empty). The Buddha begins by answering Subhuti by stating that he will bring all living beings to final nirvana – but that after this "no living being whatsoever has been brought to extinction". This is because a bodhisattva does not see beings through reified concepts such as 'person', 'soul' or 'self', but sees them through the lens of perfect understanding, as empty of inherent, unchanging self. 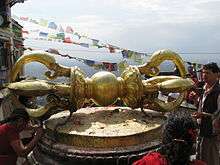 A Nepalese sculpture of a Vajra. The Buddha is generally thought to be trying to help Subhūti unlearn his preconceived, limited notions of the nature of reality. Emphasizing that all phenomena are ultimately illusory, he teaches that true enlightenment cannot be grasped until one has set aside attachment to them in any form. Another reason why the Buddha makes use of negation is because language reifies concepts and this can lead to attachment to those concepts, but true wisdom is seeing that nothing is fixed or stable, hence according to the Diamond sutra thoughts such as "I have obtained the state of an Arhat" or "I will bring living beings to nirvana" does not even occur in an enlightened one's mind because this would be "seizing upon a self...seizing upon a living being, seizing upon a soul, seizing upon a person." Indeed, the sutra goes on to state that anyone who says such things should not be called a bodhisattva. 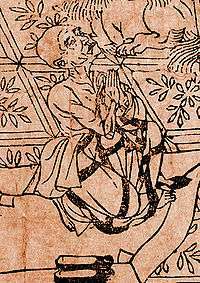 According to David Kalupahana the goal of the Diamond sutra is "one colossal attempt to avoid the extremist use of language, that is, to eliminate any ontological commitment to concepts while at the same time retaining their pragmatic value, so as not to render them totally empty of meaning." Kalupahana explains the negation of the Diamond sutra by seeing an initial statement as an erroneous affirmation of substance or selfhood, which is then critiqued ("'all dharmas' are dharmaless"), and then finally reconstructed ("that is why they are called 'all dharmas'") as being conventional and dependently originated. Kalupahana explains this final reconstruction as meaning: "that each concept, instead of either representing a unique entity or being an empty term, is a substitute for a human experience which is conditioned by a variety of factors. As such, it has pragmatic meaning and communicative power without being absolute in any way." According to Paul Harrison the Diamond sutra's central argument here is that "all dharmas lack a self or essence, or to put it in other words, they have no core ontologically, they only appear to exist separately and independently by the power of conventional language, even though they are in fact dependently originated." "However, Lord, the idea of a self will not occur to them, nor will the idea of a living being, the idea of a soul, or the idea of a person occur. Why is that? Any such idea of a self is indeed idealess, any idea of a living being, idea of a soul, or idea of a person is indeed idealess. Why is that? Because the Buddhas and Lords are free of all ideas." "A shooting star, a clouding of the sight, a lamp, An illusion, a drop of dew, a bubble, A dream, a lightning’s flash, a thunder cloud— This is the way one should see the conditioned." There is a wood block printed copy in the British Library which, although not the earliest example of block printing, is the earliest example which bears an actual date. The book displays a great maturity of design and layout and speaks of a considerable ancestry for woodblock printing. The extant copy has the form of a scroll, about 5 meters (16 ft) long. The archaeologist Sir Marc Aurel Stein purchased it in 1907 in the walled-up Mogao Caves near Dunhuang in northwest China from a monk guarding the caves – known as the "Caves of the Thousand Buddhas". Reverently made for universal free distribution by Wang Jie on behalf of his two parents on the 13th of the 4th moon of the 9th year of Xiantong [11 May 868]. This is approximately 587 years before the Gutenberg Bible was first printed. In 2010 UK writer and historian Frances Wood, head of the Chinese section at the British Library, was involved in the restoration of its copy of the book. 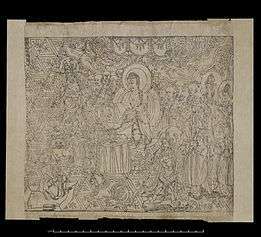 The British Library website allows readers to view the Diamond Sutra in its entirety. ↑ Soeng, Mu (2000-06-15). Diamond Sutra: Transforming the Way We Perceive the World. Wisdom Publications. p. 58. ISBN 9780861711604. Retrieved 11 May 2012. ↑ "Online Gallery – Sacred Texts: Diamond Sutra". Bl.uk British Library. 2003-11-30. Archived from the original on November 10, 2013. Retrieved 2010-04-01. ↑ "Manuscript of a Mongolian Sūtra". World Digital Library. Retrieved 2014-06-22. 1 2 Williams, Paul. Mahāyāna Buddhism: the Doctrinal Foundations. London, UK: Routledge. p. 42. ISBN 0-415-02537-0. ↑ Müller, Friedrich Max (1894). The Sacred Books of the East, Volume XLIX: Buddhist Mahāyāna Texts, Part II. Oxford: Clarendon Press. pp. xii–xix. ↑ "The Korean Buddhist Canon: A Descriptive Catalog (T 235)". A. Charles Muller. Retrieved April 16, 2015. ↑ Nattier, Jan (1992). "The Heart Sūtra: A Chinese Apocryphal Text?". Journal of the International Association of Buddhist Studies. 15 (2): 153–223. ↑ Yongyou Shi (2010). The Diamond Sūtra in Chinese Culture. Los Angeles: Buddha's Light Publishing. p. 11. ISBN 978-1-932293-37-1. ↑ "The Korean Buddhist Canon: A Descriptive Catalog (T 236)". A. Charles Muller. Retrieved April 16, 2015. ↑ "The Korean Buddhist Canon: A Descriptive Catalog (T 237)". A. Charles Muller. Retrieved April 16, 2015. ↑ "The Korean Buddhist Canon: A Descriptive Catalog (T 220,9)". A. Charles Muller. Retrieved April 16, 2015. ↑ "The Korean Buddhist Canon: A Descriptive Catalog (T 239)". A. Charles Muller. Retrieved April 16, 2015. 1 2 3 4 "Schøyen Collection: Buddhism". Retrieved 23 June 2012. ↑ Buswell, Robert Jr; Lopez, Donald S. Jr., eds. (2013). "Subhuti", in Princeton Dictionary of Buddhism. Princeton, NJ: Princeton University Press. p. 862. ISBN 9780691157863. 1 2 3 Kalupahana, David J. A History of Buddhist Philosophy, page 156. ↑ Hsing Yun (2012). Four Insights for Finding Fulfillment: A Practical Guide to the Buddha's Diamond Sūtra. Buddha's Light Publishing. p. 87. ISBN 978-1-932293-54-8. ↑ Harrison, Paul. (2006) 'Vajracchedikā Prajñāpāramitā: A New English Translation of the Sanskrit Text Based on Two Manuscripts from Greater Gandhāra', in Buddhist Manuscripts in the Schøyen Collection (Vol. III). Hermes Publishing, Oslo, p.139. ↑ "The Diamond of Perfect Wisdom Sutra". Chung Tai Translation Committee. Retrieved April 16, 2015. ↑ "Restoring the world's oldest book, the Diamond Sutra". BBC. December 5, 2010. Retrieved April 16, 2015. ↑ Wood, Francis; Barnard, Mark. "Restoration of the Diamond Sutra". IDP News (38): 4–5. Archived from the original on April 5, 2013. Retrieved April 16, 2015. ↑ "Copy of Diamond Sutra". bl.uk. Archived from the original on June 3, 2004. Cole, Alan (2005). For a close reading of the text's rhetoric, see chapter 4 of Text as Father: Paternal Seductions in Early Mahayana Buddhist Literature (Berkeley: U Cal Press, 2005), pp. 160–196, entitled "Be All You Can't Be, and Other Gainful Losses in the Diamond Sutra." William Gemmell (transl. ): The Diamond Sutra, Trübner, London 1912. Joyce Morgan and Conrad Walters: Journeys on the Silk Road: a desert explorer, Buddha’s secret library, and the unearthing of the world’s oldest printed book, Picador Australia, 2011, ISBN 978-1-4050-4041-9. Wikimedia Commons has media related to Diamond Sutra. Romanized Sanskrit and Devanagari of the Diamond Sutra in the Digital Sanskrit Buddhist Canon.